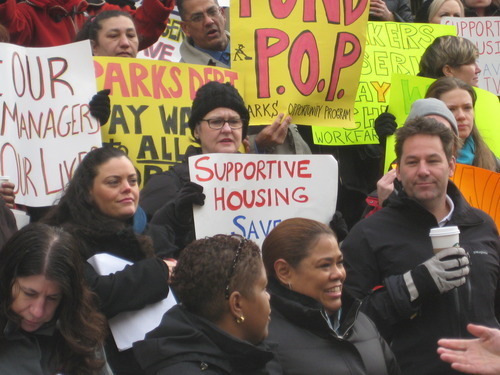 Supportive housing ends homelessness! 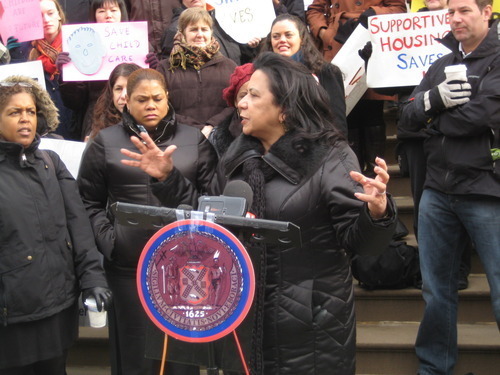 Geffner House staff members joined City Council Member Annabel Palma at a City Hall rally on March 18 to urge restoration of social service funding slashed in the Mayor’s proposed budget for FY 2014. Clinical Director Amy DeFilippi (lower left) gave her first-hand account of how case managers help tenants regain health and stay out of shelters, prisons, and emergency rooms. Her work experience is backed up by a 2010 HASA study that found that on-site case managers reduced emergency room visits by 90% and resulted in savings of $80,000 in acute care PER person per year. The right to housing and the right to healthcare are necessary, together, to end homelessness in New York. Homelessness and poor health are locked in a cycle of cause and effect. Poor health puts one at risk for homelessness, as it is estimated that one half of the personal bankruptcy cases in the US are caused by health problems. Many of these people, particularly those with mental health and substance abuse problems, end up in the costly shelter system and flood our emergency rooms with needs better served by primary care physicians. Supportive housing works to end the cycle of homelessness for our city’s neediest people. It is a permanent solution to homelessness that links people with mental illnesses, substance abuse issues, HIV/AIDS to cost affective, affordable and stable homes. With on-site case management and a full time clinical staff, tenants have the support they need to address their ongoing health, mental health, and addiction issues. I am the Clinical Director Project Renewal’s Geffner House, a 307 unit SRO, or Single Room Occupancy, in Times Square. A large percentage of our clients are from HASA. 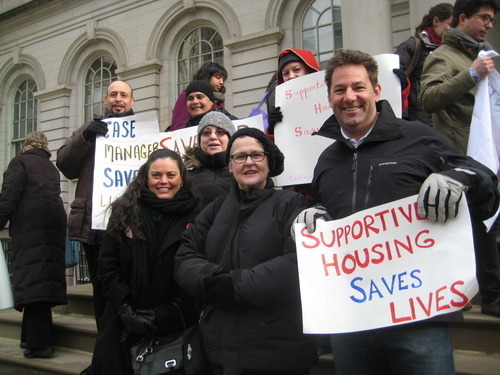 In New York City alone there are 4,500 tenants with HIV/AIDS living in supportive housing. I have been working as a supervisor and case manager for several years and in this time I have seen the work that on-site case management does to stabilize people which limits their recidivism into the shelter system, prison, and emergency rooms. In working with one of my clients I have witnessed his four yearly inpatient psychiatric hospitalizations dwindle to two years without any inpatient visits. With my support he has found the right mental health providers to stabilize him psychiatrically, and I have provided him with the consistent reminders necessary to take all of his medications daily. He has now developed a healthy routine that he did not feel was possible from his many years of being street homeless. With my support and encouragement he has established consistent medical services. The stability in his health has given him the courage to battle his 45 year substance abuse and dependence problems. I am happy to say that he is now one year sober and counting. He attributes this to the daily support and encouragement our consistent therapeutic relationship has provided him. To use his words “you have reminded me that I have something to live for”. I have come here today to say that the proposed budget cuts will not save tax-payers money. Churchill, Truman, Dostoyevsky have all said something along the lines of “A society is indeed measured on how we treat our most vulnerable population”. If we truly believe this as a society, then these proposed budget cuts are preposterous. They won’t save our city money, but they will deprive some of our most needy fellow New Yorkers of the much needed services and support required to live an independent life. These proposed cuts will not save tax payers money. 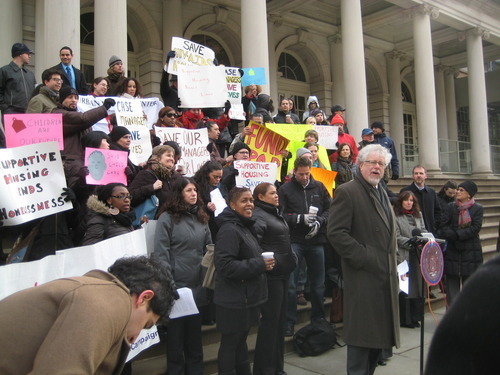 In 2010 HASA did an analysis of HASA funded supportive housing sponsored by Harlem United. They found that the result of on-site case managers reduced emergency room visits by 90%, and nursing home reliance by 54%. This resulted in a savings of $80,000 dollars in acute care PER person per year. I am here to thank you for restoring the budget cuts from last year, and to thank the City Council for its ongoing support of HASA programs. But I am here, for the third year in a row, to ask you to continue to make supportive housing programs a priority for some of our neediest New Yorkers and to restore the proposed budget cuts.